Preheat the oven to 375º F. Cream the butter and sugar together until fluffy and smooth. Add the egg and vanilla in and blend. Mix the flour, powder, soda, and salt in another bowl, then add it to the creamed mix alternating with splashes of the buttermilk. Roll half of the dough out to a 12-inch round. 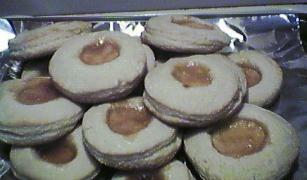 Cut 3-inch round cookies out of it, and punch out a 1-inch small circle from the center of half of those. Put the whole cookies on ungreased sheets one inch apart, moisten the edges, and put the cut rounds on top. Fill the hole with a little bit of apricot. Bake them for 10 minutes and cool on racks. Repeat this process with the remaining dough.